Saturday will be our last home game of the season. As captain of the Sparks, I’ve seen this amazing group of women grow as individuals and as a team. 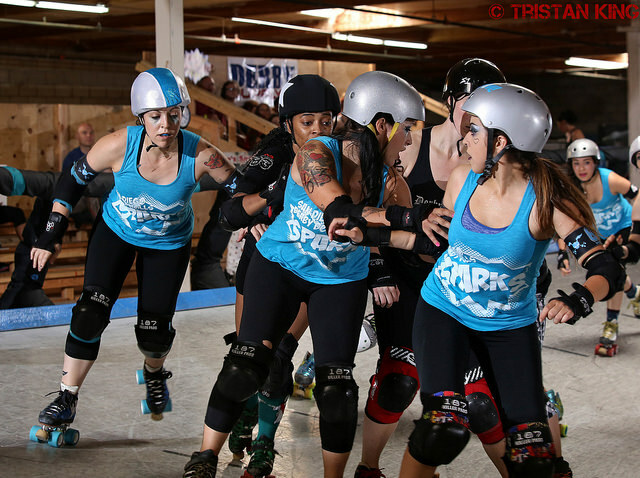 A few skaters joined the Sparks having never played in a bout before. A few more joined having never played in an adult bout. But most of us joined having played on separate home teams, against each other. It’s hard to strip away those home season grudges and team biases. But we all did…willingly, too. 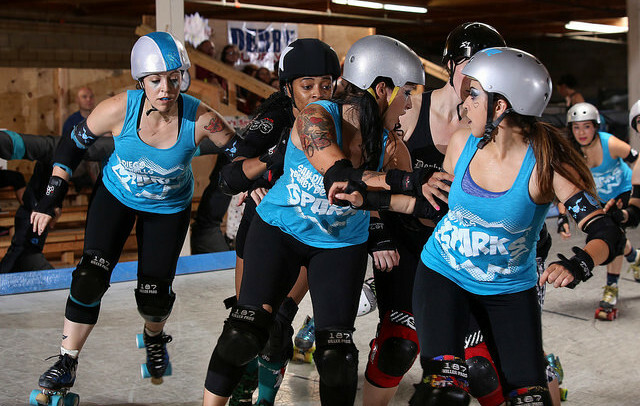 Under the strong leadership of SDDD veteran skater Lemon Drop, the Sparks learned what it meant to be a team…on and off the track. We skated together, cross-trained together, did thousands of burpies together and supported each other through the good and the bad. We learned new strategies and pushed ourselves to become a cohesive single unit – something not easy to do in just a few months. But we did, because we are the Sparks… and we sparkle! And next season, after the home team drafts and everyone starts wearing their home team colors again, I know that all of us will secretly cheer on the inside when one of our fellow Sparks jumps the apex against our team’s blocker or gets a really big hit on our jammer. Because we’re a team and always will be a team. So, come watch us play the North County Derby Alliance & Friends on Saturday and help cheer us on to victory. It’ll be awesome! Doors open at 5:00pm on Saturday and the bout is at 7:00pm. Our Juvenile Dollinquents will have a 30 minute exhibition game at 6:00pm. Watch some of the newest members of the All-Star team play in their first bout! These bouts will be held in our private Dollhouse in downtown San Diego, open to only 200 of our closest friends and family. Street parking is free after 6:00pm. Don’t forget to arrive early to check out the newest apparel at our merchandise stand and our vendors in our Vendor Village on the flat track under the disco ball! A concession stand will be full of pizza, popcorn, and soda to satisfy your hunger. All ages are welcome and there is free admission for children 5 and under! Tickets will be available at the door until sold out. Buy your tickets now!